December 10, 2014, 1:20 PM · What is a music student to do, over the holidays? Though the holidays can be a very busy time for musicians, music students may find a bit of a lull in their studies during vacation days. Perhaps there was a motivating fall recital or holiday concert, but now it's over. School lets out. Teachers go on break, and lessons go on hiatus. Perhaps one travels to see family or friends. Should the violin go along, or should it just go on break, too? I never begrudge people a short break. It's important to connect with family and friends, to do charitable work, to attend a religious service, to throw a party, to do whatever makes that spirit of culture and community come alive for you. But I'm not ready to tell you to put the bow down entirely! Most people have at least a few days off from work or school during the holidays, and if time and family/religious obligations allow, this "in between" time can prove quite fruitful for you and your violin. Without the pressure of a recital next week or even a lesson next week, you can plan some practice sessions that are purely experimental and a little less goal-oriented. Maybe it's time to sight-read some new music, or just try something that isn't an assignment. Did you stop doing scales, because you were so busy preparing for concerts? Well, do some leisurely scales, or focus on a technical matter that's been on the shelf. Maybe you want to play something from a long time ago, something you just simply liked. Maybe you'd like to just mess around and improvise. If you're lucky, perhaps you will see people who can play chamber music with you, what better way to bond over the holidays? 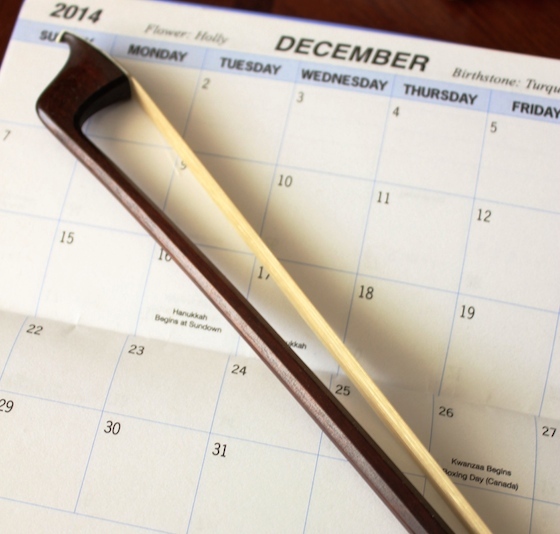 For some, it's just not possible to take the violin on holiday break, or to get to practicing. If that's the case, then you can still accomplish something by keeping your ears open. Long plane ride? Load your iPod with a recording (or several!) of your new piece and bring some nice headphones. Staying at home? Consider attending a concert or religious service with live music. What ever the next few weeks holds for you, I hope it will be filled with good music! I welcome your suggestions for making the most of holiday break time. December 10, 2014 at 11:24 PM · I find it to be a great time to do some nice detail oriented and technically conscious practice, without pressure of having a caprice ready or a concerto memorized by the next lesson. I grow a lot as a violinist on break, which is one reason I never take lessons over Christmas break and not many through the summer. December 11, 2014 at 05:14 PM · Oh, to have a few days when I can actually practice like mad. December 12, 2014 at 02:01 AM · Chamber music for lucky me the Sunday before the holiday!!! December 12, 2014 at 06:08 PM · How fun, Mendy! December 15, 2014 at 08:39 PM · I'll have a streak of concerts behind me once the holidays come, but I'll need to be gearing up for the next round already, plus a chamber music workshop. Most definitely looking forward to the holidays because of the extra time to put in some good practicing and have also scheduled chamber music with friends.